2018-19 has been a very eventful year for our company. We commissioned our largest 3000-ton press, we participated for the third consecutive time at the IMTS in Chicago, and effective, 1st February 2019, Buffalo Abrasives Inc. became a fully owned subsidiary of Sak Industries. With the acquisition of Buffalo Abrasives, we can now offer our customers a ‘Made in India’ brand and a ‘Made in USA’ brand. 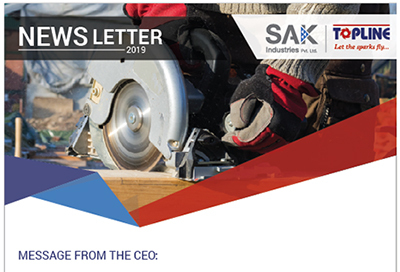 We hope to derive numerous synergies between Sak and Buffalo Abrasives as we grow our revenues and our market share with customers. …. We have worked hard for the last 20 years, to make TOPLINE into a dependable, ethical and reliable supplier of quality abrasives. This has been possible through the hard work, loyalty and commitment of our employees….